I have been super busy these few weeks since coming back from my mini getaway. Been preparing for Chinese New Year (loads of shopping), cleaning the house (chores are like never-ending, lol) and hosting my in-laws who are visiting from England. Where did all the time go, seriously? Haha. 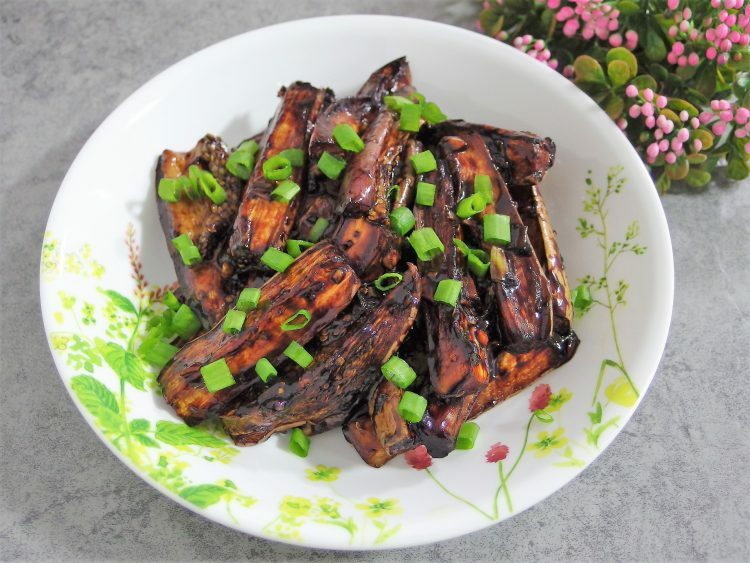 Today I’m sharing another Chinese recipe that is inspired by the dish 酱烧茄子 (Jiang Shao Qie Zi) which is basically a stir fried eggplant dish. Nothing too fanciful. The use of dark soy sauce will make the dish look black/dark but a sprinkle of spring onion garnish will spruce it up immediately. Also added vinegar to give it some acidity so the flavour becomes more refreshing. Generally, the eggplant strips are first fried till tender before stir frying further with condiments and sauce. For my version, I chose to bake the strips in the oven so the dish wouldn’t be overly oily or greasy. Preheat oven to 180 deg C. Line a baking tray with parchment paper. Arrange the eggplant pieces on the baking tray in one single layer. Bake for 15 minutes till eggplant is tender. Remove from oven and set aside to cool. In a bowl, combine dark soy sauce, vinegar, sugar, light soy sauce, corn flour, pepper and 1 tbsp water. Stir to mix. Heat oil in pan. Saute the ginger, garlic and half of the spring onions till fragrant. Add in the eggplant pieces and sauce mixture. Briefly stir fry till the sauce thickens up. Sprinkle 3 tbsp water and a small pinch of salt over the eggplant. Stir fry till well combined. Garnish with remaining spring onions before serving.